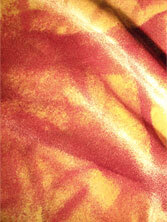 Plain silk/viscose velvet (18%/82%) suitable for devore. The white dyes with cold-water-fix Procion dyes, steamfix dyes that can be steamed or microwaved, and Jacquard Green Label dyes with fixative. Black velvet is wonderful decorated with metallic and pearlised paints, glitters, foils and more. Paint, spray, dip, etch, discharge, stamp, decorate - have fun!